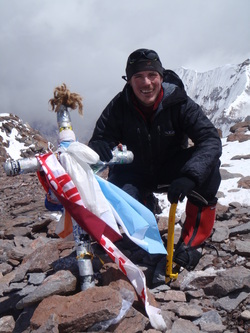 Aconcagua, the worlds highest mountain outside the Himalaya, was my first experience of organising an expedition from scratch with the added challenge of my first visit to altitude. Our bible was R J Secor’s climbing guide to Aconcagua. It’s out of date descriptions and advice added to the challenge of the mountain and gave us a memorable trip! Secour’s black & white guide was written in 1994 but feels a lot older and there was a definite need for a detailed and modern guide. At first glance Jim Ryan’s full colour offering presents a strong case for becoming the new standard text on the mountain. Where the previous guide focused on climbing the mountain by a variety of routes Ryan concentrates on the most popular Normal & Polish Glacier routes. However the book’s strength is the background information covering almost any subject that maybe of interest. Sections cover travel, culture, weather, history, local attractions, equipment, flora & fauna, etc, etc. The numerous supporting photos, while not being stunning, provide an accurate feel for the region and the nature of the undertaking. The inclusion of other mountains for acclimatisation or getting away from the crowds is particularly welcome and I can defiantly recommend the Vallecitos area. The biggest criticism is the lack of information covering the actual routes on Aconcagua. A failure to provide a map of the mountain means that the few directions and descriptions given are almost meaningless and the relationship between the routes and camps isn’t clear. This is also a problem for the other mountains and acclimatisation areas described. On a guided trip this isn’t a problem but if going it alone then try and get hold of a copy of the old guide and/or a decent map. Overall the guide’s content is extensive but it can sometimes be tricky to find the information you require as the layout and structure of the book isn’t perfect. All the facts you require are there, plus many more you didn’t know you needed, but you might have to hunt for them and cross-reference to get the full picture. Small mistakes have crept in such as differences between the recommended kit list and the items suggested in the text. In particular the medical / acclimatisation information is confusing and potentially dangerous. Ascending at the guides recommended 600m – 1000m a day with a rest day every 3000m will almost certainly guarantee you an episode of altitude sickness, if not worse. Try for a maximum increase in your sleeping altitude of 300m a day with a rest day every 1000m for a much more enjoyable trip. This aside this is a very impressive and detailed guidebook which was sorely needed. It describes itself as the complete guide to climbing Aconcagua, which isn’t far off the mark, and as such I guess will soon become the definitive guide. For those planning their own expedition it should prove indispensable while still being of great interest to those on a guided trek even if only to occupy your mind while waiting for the notorious Viente Blanco or white wind to subside!